Gulf front opportunity at Palazzo, a premier luxury resort on the west end of Panama City Beach! 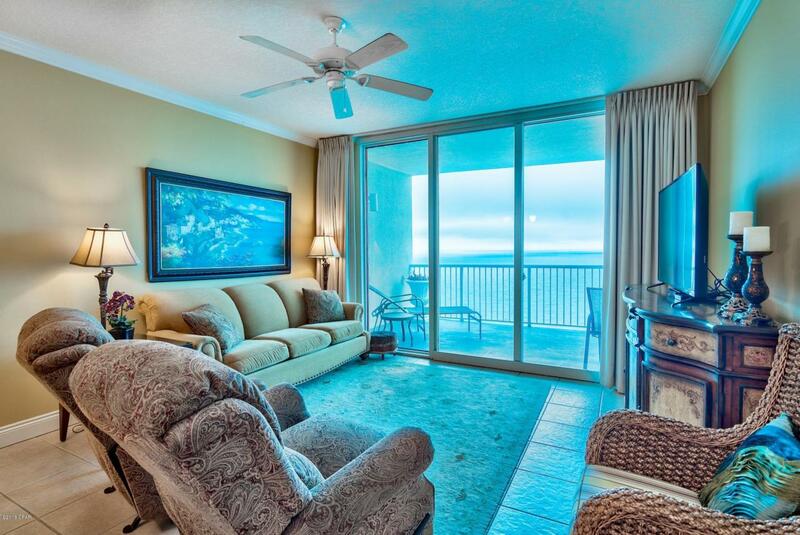 This is a fully furnished 2-bedroom, 2-bath Gulf front condo with a bunk room, and Gulf front master bedroom! Floor to ceiling windows and doors offer incredible views of the Gulf and pristine beaches below. Tile floors extend throughout the entry, kitchen, dining, living area, and bathrooms. The charming kitchen is accented with recessed lighting, granite counters and updated with stainless steel appliances. This unit is a great rental property investment as it features a bunk room to sleep additional guests. The open floor plan make dining, entertaining and relaxing easy. The dining area easily seats 6 with addition seating available at the large wrap around breakfast bar.The large 253 sq ft private balcony presents amazing unobstructed views of the Gulf and beaches. It is the ideal spot for entertaining, outdoor dining, or just relaxing and enjoying a Gulf front getaway. Floor to ceiling glass sliders offer access to the private balcony from the living room and the Gulf front master bedroom. Palazzo features convenient parking in the 4 levels of parking under the building, so this unit has a 16th floor elevation with stunning views up and down the coast! The Gulf front master bedroom has direct access to the balcony. Let incredible views of the Gulf be the last thing you see at night and the first thing you wake up to. The Gulf front master is furnished with a king bed, flat screen TV, and features a walk-in closet and en-suite master bathroom. The bathroom includes a dressing area with separate vanity, big Whirlpool tub and separate walk-in shower. The guest bedroom and bunk room share a full bath. This unit has a full size washer/dryer closet with additional storage. This is a lower density building for Panama City Beach, so the unobstructed Gulf views and dedicated beach give you a quieter slice of paradise. Palazzo amenities include an elevated Gulf side pool, hot tub along with a boardwalk and designated beach with complimentary beach service (Mar-Oct). The fitness facility and on-site lobby is Gulf front and there is a meeting room available. The HOA is established and does a phenomenal job of keeping the building maintained. At Palazzo, you are on the desirable West End of Panama City Beach just 1 mile from Pier Park shopping center and less than 20 minutes from the Panama City Beach International Airport. Unlike the competition, Palazzo is a low-density building consisting of only 129 direct Gulf Front units and has four levels of covered Gulf Front parking under the building - no need for massive parking garages with elevated walkways across the street. Do not miss out on this incredible opportunity to own an affordable 2-bedroom unit at one of the finest condominiums in Panama City Beach!